Monster Energy / Arctic Cat / Ram Truck’s Tucker Hibbert was untouchable at rounds 11 and 12 of the ISOC National Snocross tour in Joliet, Ill. Hibbert put on an impressive show at Route 66 Raceway’s drag strip, turned snocross course, by winning all four of his qualifying rounds and both final events. Despite battling fierce winds and low visibility, Hibbert convincingly won both his qualifying races and the final Friday night. Saturday brought warmer weather, and with that, a big, high-energy crowd. Hibbert had his most intense race of the weekend in the first round of qualifying Saturday night. He jumped the start of the nine-rider race, was sent to the back row and came out of turn one in last place. With only eight laps on the 40-second track, he immediately charged forward and by the end of lap three, he was on the rear bumper of race leader no. 324 Kyle Pallin. The two riders raced side-by-side through the split lane, dogleg section of the course. With Hibbert on the inside and Pallin on the outside, Hibbert blocked Pallin as the lanes merged, took the lead and runaway for the win. After winning his second qualifying round, Hibbert had first start line pick for the 15-rider, 14-lap final event. Selecting the far inside, Hibbert got a solid jump off the line but was shut down by no. 837 Ross Martin. Hibbert followed Martin for a lap and a half, then, made the pass for the lead in exact same spot he passed Pallin in the first round of qualifying. With a clear track in front of him, Hibbert had full control of the course to take his 104th pro national victory. Next up for Hibbert is the Ram Truck National at Soaring Eagle Casino in Mt. Pleasant, Mich. With a 97-point lead, the defending Pro Open National Champion will enter the final two stops of the ISOC tour in prime position to win the 2014/2015 championship. 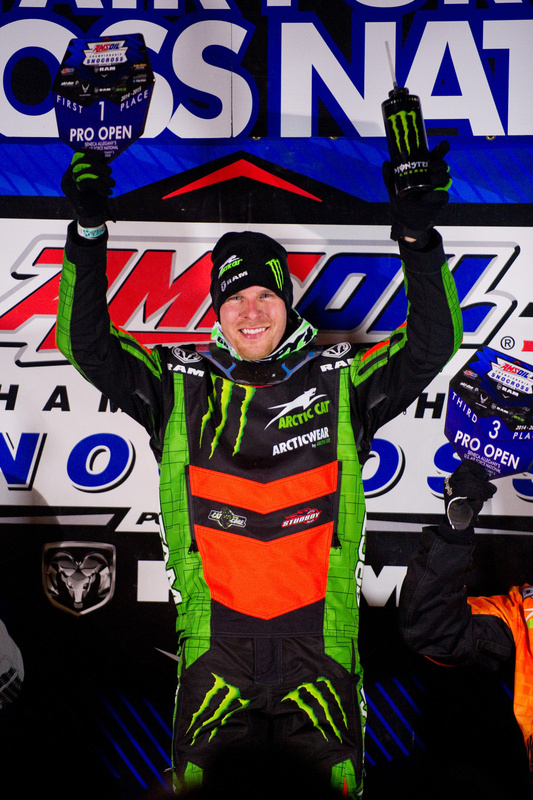 Monster Energy / Arctic Cat / Ram Truck’s Tucker Hibbert won both Pro Open finals in Salamanca, NY to sweep the ISOC National Snocross tour’s Eastern National. For the third consecutive year, Seneca Allegany Casino and Resort pulled in a massive crowd for the tour’s only stop east of Michigan. After racing on a short, tight course in Deadwood, SD, Hibbert was excited to get on the Eastern National’s high-speed, technical track. By riding smart and smooth, Hibbert recorded one of his best race weekends of the 2014-2015 season. Friday night, Hibbert went 2-2 in qualifying to lock down the number one start line pick for the main event. He was quick off the line, took the lead exiting the first turn and never looked back to win the 15-rider, 14-lap final. 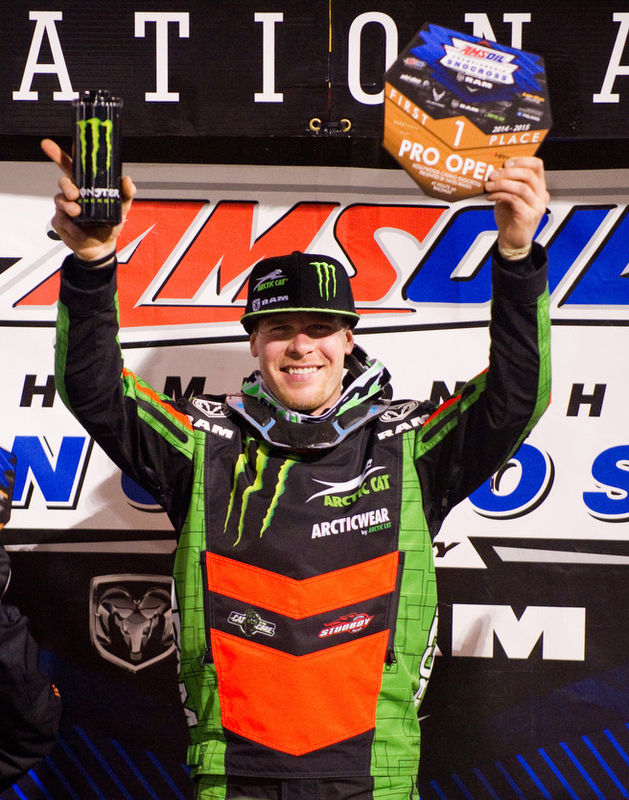 Hibbert continued his successful start streak and won both qualifying rounds Saturday night. Despite a solid start in the final, he slotted into fifth place after riding cautiously through the first corner and into the front straightaway’s long rhythm section. He spent the next five laps focusing on riding mistake free and making clean passes to get behind holeshot winner and leader, no. 837 Ross Martin. After two laps of closing the gap on Martin, Hibbert made his move in the ‘S’ turn and pulled away to take his 102nd Pro National Snocross victory. Hibbert now holds an 86-point lead in the ISOC Pro Open Championship. After a weekend break, the tour will make its debut stop at Route 66 Raceway in Joliet, Ill. February 20-22. Visit tucker-hibbert.com to follow him as he continues to chase his ninth national championship. To celebrate Tucker’s 100th Pro National Snocross victory, he released this special t-shirt. The back features a detailed image of him rallying through the field in his heroic come-from-behind win January 31 in Deadwood, SD. Follow the link below to pre-order your #WONhundred shirt. 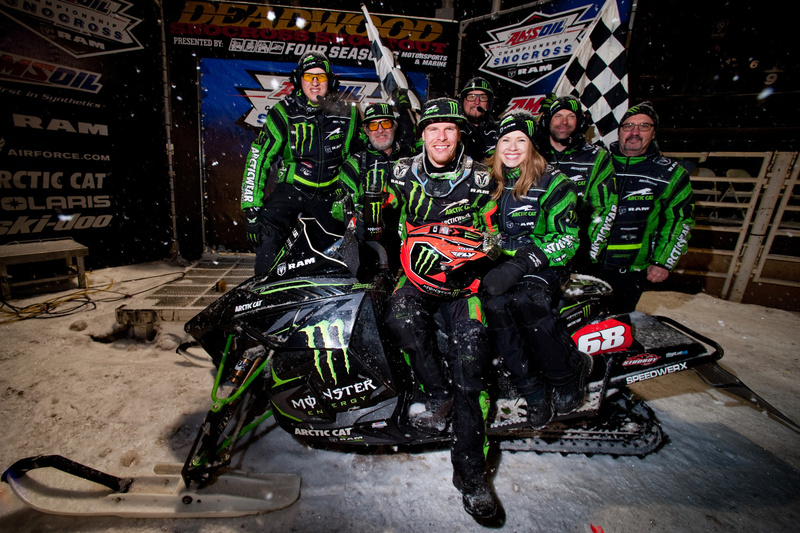 Monster Energy / Arctic Cat / Ram Truck’s Tucker Hibbert captured his 100th Pro National Snocross victory in a heroic come-from-behind win in Deadwood, SD Saturday night. With an electric crowd packed into the Days of ‘76 Rodeo Grounds, Hibbert rallied through the field with blazing speed and determination to record this historic career milestone. Taking his 99th victory in December, Hibbert fell short of number 100 three straight rounds. He finished 4-2 at Canterbury Park in Shakopee, Minn. and came within a sled length of winning Friday night at Deadwood after an aggressive ride. Hibbert entered Saturday with a fresh focus and drive. He turned the fastest lap in practice, won both qualifying rounds and grabbed the Stud Boy holeshot in the 15-rider, 22-lap main event. Out front early, it momentarily looked as though Hibbert could run away with his 100th win. In turn two, he hit a wall of snow left by a groomer and was rolled on his side – collecting Tim Tremblay in the process. After struggling to get his sled unlocked from Tremblay’s sled, Hibbert reentered the race nearly a lap down and 20 seconds behind the leader. What happened next, was a downright impressive display of determination and talent. Hibbert charged forward as if no one else was on the short, bullring-style track with him. Lap after lap, he made clean passes – crushing the gap between him and the race leader. Without a clear idea where he was in the running order, he kept pushing and didn’t give-up until he saw the checkers and flames go off on the finish-line jump. Hibbert now holds a 64-point lead in the ISOC Pro Open Championship. Next up is the Eastern National in Salamanca, NY Feb. 6-7. Visit tucker-hibbert.com to follow him as he continues to chase his ninth national championship. Note: These statistics do not include X Games, the FIM World Championship or other one-off snocross events.